Living at the Salvation Army Lambuth Center in Denver, Luz Hernandez and her two children face some uncertainty about their future. But uncertainty and all, their lives clearly feel better to them than they did last spring. About six months ago, Hernandez was holding down two jobs while the family lived in a Westminster apartment. The jobs—part of an effort to emerge from a deepening financial trench—left little time for Hernandez to spend with her daughter Lesley Velasquez, 13, and her son Adrian Velasquez, 12. “I would hardly see them,” she said. Hernandez, who spoke quietly, seemed to relish the time she could now spend with her children. Hernandez talked about her move to the shelter as her son worked on lessons in a tutoring program begun this year by Denver Public Schools. Luz said her daughter, who wasn’t at the shelter that afternoon, would also be taking up the lessons. With wooden floors and modest but comfortable chairs, the shelter is an inviting place, and the moods of the families staying there seemed serene. The children at the shelter are studying in ways they wouldn’t have been able to a year ago. DPS started the tutoring program where Adrian was learning with federal funds made available by the American Recovery and Reinvestment Act. The ARRA funds are part of a big increase in federal dollars available to Colorado public schools to help homeless students this year—but the problem itself is growing at a daunting pace. 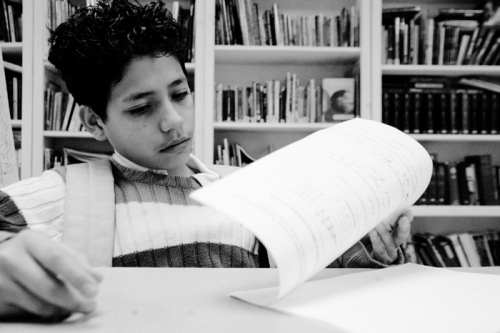 Adrian Velasquez, 12, works on a math worksheet at the Lambuth Center.